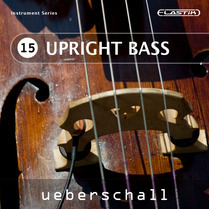 As its title suggests, Upright Bass offers around 1GB of solo upright bass loops — just over 400 in total — covering a range of tempos from 60 through to 130 bpm. In addition, each loop is presented in three different versions, recorded via a microphone, a piezo pickup and then a premixed blend of the two. All the loops are fairly dry so you can add your own processing as required, but, with the combination of different versions, you have the convenience of the premixed loop, the smoothness of the microphone recording or, if required, the ability to blend in the more noticeable attack of the piezo version. Usefully, aside from the three different versions, the loops are also organised at two further levels: by tempo into three distinct tempo ranges, and then into 'performances'. The latter contain a varying number of individual loops all recorded at the same tempo/key combination and are obviously intended to allow you to combine them to construct a single coherent performance. The number of loops within each of these performances varies between four and 20, so, for all but the most compact of the sets, there is generally plenty of choice when it comes to building a complete musical performance. The upright bass is perhaps most closely associated with jazz and, yes, you could use these loops to build a suitable bass performance to sit under your next jazz compositions. However, the playing, while very solid and rhythmically interesting, is very disciplined and really doesn't stretch out into the esoteric harmonic reaches that some virtuoso jazz players can go to. Instead, most of what you get is just great solid bass lines that could just as easily sit beneath contemporary pop tunes rather than something with a more obvious jazz influence. Throughout, the recordings capture the often challenging sound of the acoustic bass very well and, while there is plenty of bottom end, things don't ever get out of hand. (…), Upright Bass is well recorded, well played and represents a decent bang for your buck if you want a slice of genuine upright bass to build your next tune around.